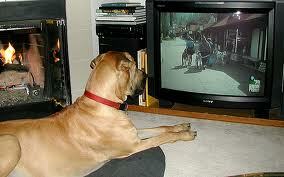 For A Pooch Who Has Everything: DogTV! ‘DogTV, a cable network for dogs, launched in San Diego this past Monday aimed at stay-at-home canines and their workaday owners who want to feel better about time apart. Free at launch, people will eventually pay $4.99 a month for the channel, but that may seem a small for sum for fido’s peace of mind. This could turn into a whole new industry.